Philz started in San Francisco, and slowly spread throughout the Bay Area. The first Philz I went to was in Downtown San Jose, after a friend introduced me to the minty, refreshing, strong iced coffee. 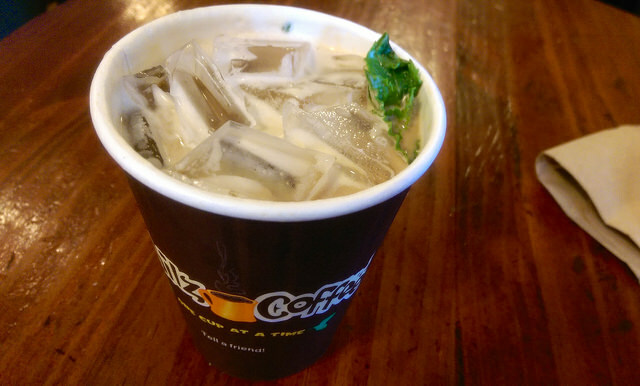 I stopped by a Philz on my way to work and grabbed a cup of Philz’ famous mint mojito iced coffee to wake me up! The iced coffee is very strong. A small cup is enough to keep me awake the rest of the day. I once got a medium sized drink in a early afternoon, and was awake till 3am! Bad choice unless you’re gaming or studying through the night. Philz’ Mint Mojito is creamy java goodness crushed with ice and fresh mint leaves and mixed with indulgent dairy products. This cool, refreshing caffeine cocktail is best consumed sitting at a cafe table outside this hipster hangout on a sunny, hot afternoon, while listening to one of Philz’ many musician patrons.